This textbook is suitable for the following courses: Introductory Macroeconomics and Principles of Macroeconomics. Taylor and Weerapana present modern economics in a form that’s intuitive, relevant, and memorable to learners with no prior exposure to the subject. 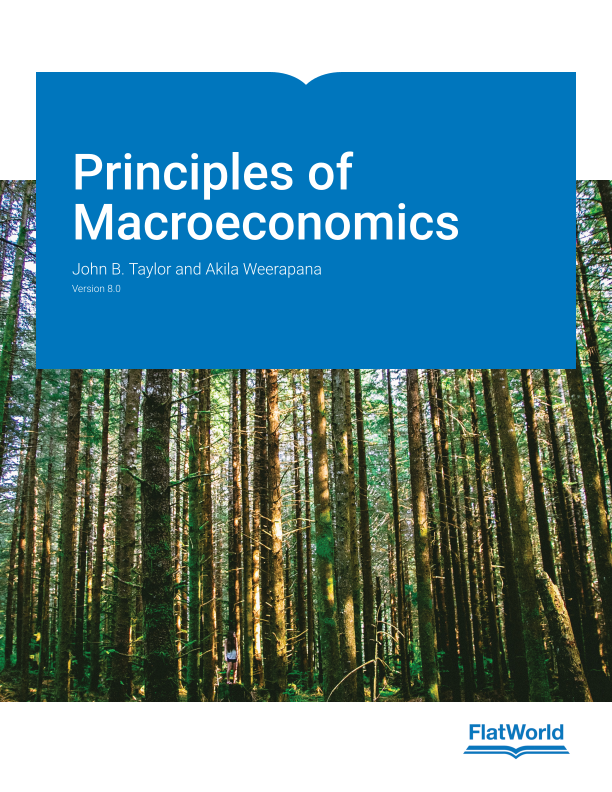 Principles of Macroeconomics engages students by emphasizing the central idea of economics throughout: that people make purposeful choices with scarce resources and interact with other people when they make these choices. The authors bring to bear recent and extensive classroom-based experiences to select real-world examples of how markets work; provide clear explanations of why markets are efficient when the incentives are right and inefficient when the incentives are wrong; and outline examples of economic choices students actually face. The authors stress long-run fundamentals, but they also discuss current public policy issues when the short run matters. Now published by FlatWorld at an affordable price in print and digital formats suited to today’s students. Updated data and content bring coverage of macroeconomics through to the beginning of 2017. Incorporates discussion of new monetary developments since 2011, including QE3, taper, raising of interest rates and the move to negative interest rates in some countries. Covers the debate about whether the Fed is unwinding its extraordinary policy measures at an appropriate pace as well as whether the fiscal policy measures implemented in the 2008/09 recession worked, based on academic studies. Discusses labor market developments, including the fall in unemployment rates, slow improvement in the employment to population ratio, and the falling labor force participation rate of men. Expands the discussion of productivity slowdown, including Robert Gordon's claim that economic headwinds will keep U.S. productivity growth low in the foreseeable future. Stimulating vignettes at the beginning of each chapter. Problems which have been carefully selected, revised, and tested for this edition. Questions for review at the end of every chapter. Brief reviews at the end of each major section summarize the key points in abbreviated form as the chapter evolves. Definitions of key terms appear in the margins or hyperlinked online. FlatWorld has partnered with Cognero, a leading online assessment system, that allows you to create printable tests from FlatWorld provided content. Once you've completed creating your test, the file can be imported into the following Learning Management Systems: Blackboard, Canvas, Brightspace/D2L, Moodle and Respondus. Files are also available in Word and PDFs. Prefer printable tests? Download our test generator and start creating printable tests today! We offer a test generator for both PC and Mac users. John B. Taylor is one of the field’s most inspiring teachers. As the Raymond Professor of Economics at Stanford University, his distinctive instructional methods have made him a legend among introductory economics students and have won him both the Hoagland and Rhodes prizes for teaching excellence. Professor Taylor is also widely recognized for his research on the foundations of modern monetary theory and policy. One of his well-known research contributions is a rule—now widely called the Taylor Rule—used at central banks around the world. Taylor has had an active career in public service, including a four-year stint as the head of the International Affairs division at the United States Treasury, where he had responsibility for currency policy, international debt, and oversight of the International Monetary Fund and the World Bank and worked closely with leaders and policymakers from countries throughout the world. He has also served as economic adviser to the governor of California, to the U.S. Congressional Budget Office, and to the President of the United States and has served on several boards and as a consultant to private industry. Professor Taylor began his career at Princeton, where he graduated with highest honors in economics. He then received his Ph.D. from Stanford and taught at Columbia, Yale, and Princeton before returning to Stanford. Akila Weerapana is an Associate Professor of Economics at Wellesley College. He was born and raised in Sri Lanka and came to the United States to do his undergraduate work at Oberlin College, where he earned a B.A. with highest honors in Economics and Computer Science in 1994. He received his Ph.D. in Economics from Stanford in 1999, writing his dissertation on monetary economics under the mentorship of John Taylor. Since then, Professor Weerapana has taught in the Economics Department at Wellesley College. His teaching interests span all levels of the department’s curriculum, including introductory and intermediate macroeconomics, international finance, monetary economics, and mathematical economics. He was awarded Wellesley’s Pinanski Prize for Excellence in Teaching in 2002. He also enjoys working with thesis students. In addition to teaching, Professor Weerapana has research interests in macroeconomics, specifically in the areas of monetary economics, international finance, and political economy.